Singapore's CapitaMalls Asia Ltd is keen to expand in Malaysia and plans to have a property trust in the future is still on the drawing board. CapitaMalls, a unit of property developer CapitaLand, views Malaysia as a key market in the region and it could develop new properties or buy existing ones, said its head for Malaysia Sharon Lim. "Malaysia is a key market for us. We don't think we will stop at three malls," Lim said at a press briefing in Kuala Lumpur yesterday. 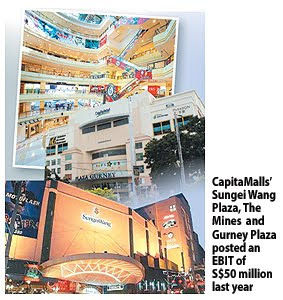 In Malaysia, CapitaMalls owns and operates three shopping complexes - Sungei Wang Plaza in Kuala Lumpur, The Mines in Seri Kembangan Selangor and Gurney Plaza in Penang. An ideal portfolio is a mix of both existing properties and assets that it builds on its own. In Malaysia, the three malls provide a total nett lettable area of 1.9 million sq ft. When asked about plans to develop a mall in I-City owned by I-Berhad as previously reported , Lim said "we have spoken to them. But we are not ready to announce anything." As for plans to set up a real estate investment trust in Malaysia, it is still an option. "It is our stated strategy that ultimately, the aim is to list in the market where we operate in," she added. She, however, declined to provide any time frame as to when this could happen. In 2008, it was reported that CapitaLand Ltd may delay the launch of its retail property trust in Malaysia in light of the market condition then. The three properties in Malaysia were acquired at around RM1.8 billion and have collectively undergone a RM100 million spruce-up, adding retail space and asset enhancement. Lim added that return on investment for the properties could take anything between 10 to 15 years. Meanwhile, on the performance of the three malls, Lim expects a 5 per cent improvement over an earnings before interest and tax (EBIT) in the current financial year ending December 31 2010, similar to the anticipated growth in the Malaysian economy. However, she did not discount the fact that growth for the year could be more. The three malls posted an EBIT of S$50 million (RM118.5 million) last year and was the third best performing market for CapitalMalls after Singapore and China. CapitaMalls also operates in India and Japan. Since its entry into Malaysia in end-2007, it has seen an improvement in net lettable area of 4.5 per cent to 1.87 million sq ft while retail rates have inched up 18.5 per cent. The occupancy at all three malls are virtually full compared with the national average occupancy of Malaysian malls of some 75 per cent. Big names such as Sime Darby Bhd is said to be among the companies interested in the redevelopment of Pusat Bandar Damansara in Kuala Lumpur. Johor Corp (JCorp) chief executive officer Tan Sri Muhammad Ali Hashim said several companies have shown interest in the project. "A number of companies including Sime Darby and Malton Bhd are said to be among the interested parties, but who gets it depends on who gives the best price," he said, noting that no decision has been made. Johor state investment arm JCorp, through its 27.7 per cent stake in Damansara Realty Bhd, owns nine of the commercial blocks that make up Pusat Bandar Damansara. Built in 1981, Pusat Bandar Damansara - also known as the Damansara Town Centre - plays host to a handful of corporate headquarters as well as government organisations, including the Ministry of Housing and Local Government and the Department of Immigration Malaysia. "It is obvious that something needs to be done on the property and unlock its true value," Muhammad Ali told Business Times in Bangi, Selangor, yesterday. He earlier gave a talk titled "Today's Business World" at the National Conference - CEO's Mind: Today's Talk for Tomorrow's Walk. He said JCorp will either sell its property to a third party or develop it on its own to create wealth for the group. A recent news report quoting sources said Malton would refurbish parts of the 28-year-old complex owned by JCorp. The job, said to be valued at RM700 million, could also involve demolishing certain portions of the old structure to make way for a new development. Additionally, the project which is expected to be undertaken over the next five years may require Malton to develop a plot of land adjacent to the complex. PETALING JAYA: IGB Corp Bhd, which has in the past two to three years expressed an interest in restructuring the company’s assets into a real estate investment trust (REIT), may find it more worthwhile not to inject The Gardens Mall into the trust. An analyst with a foreign investment bank said The Gardens Mall lacked the financial track record for a listing as it had only been operational for about three years. “The Gardens Mall with the lack of a track record will lower the valuation of the REIT,” the analyst said. He said management might be more interested in a REIT listing now compared with three years ago as it could have come to terms with the valuation of the properties under IGB. “Three years ago it was not very happy with the valuation but I suppose it has come to accept the market’s valuation so it’s more willing to list now,” he added. On Monday, KrisAssets Holdings Bhd group managing director Robert Tan said following the company’s AGM that the company, which owns Mid Valley Megamall and is in turn about 75%-owned by IGB, was looking to list its properties in the 50-acre Mid Valley City into a REIT. However, he said, The Gardens Mall was still not ready to be injected into KrisAssets although the mall was doing well since its opening in 2007. Meanwhile, Standard & Poor’s Malaysia Sdn Bhd senior analyst Alexander Chia said in an email reply that the delay in restructuring IGB’s assets into a REIT was due to a drastic drop in market value of REITs in 2008 and early 2009 with poor market sentiment for REIT listing another obstacle. He said the impending listing of Sunway REIT with an estimated asset value of RM3.7bil would make a difference to the staid REIT market, which had often been viewed as unexciting. Chia added that the large and diversified portfolio of property investments of the Sunway REIT would help to attract more institutional investors’ interest and enhance liquidity of the REIT market. Property developer IGB Corporation Bhd is looking to aggressively expand its hospitality brand locally and abroad this year. Group Managing Director Robert Tan Chung Meng also said the group has changed its focus from property development to property investment, due to the strong recurring income. "We are reviewing several proposals and are in discussions for possible hotel projects in countries such as Japan, China, as well as the Indochina market," he told reporters after the company's annual general meeting on Wednesday. Tan said, the company would be opening its three-star, St Giles Hotel Makati in Manila, in three weeks time. The hotel has more than 500 rooms. He highlighted that the cost of the project was more than US$30 million. With several hotel properties coming on-stream this year,the overall rooms inventory will increase to 5,900, with 4,400 under its management. The group's pre-tax profit for the financial year ended March 31, 2010 rose to RM58.3 million from RM54.01 million in the same period last year. However, revenue decreased to RM156.13 million from RM165.5 million previously. It would be a healthy year for the construction industry with support expected in the next two quarters from projects awarded under the RM60 billion second stimulus package, Master Builders Association Malaysia (MBAM) said yesterday. Among projects under the country's stimulus packages include the RM2 billion new low-cost carrier terminal (LCCT) and the RM3 billion LRT extension (two lines) in the Klang Valley. "These projects will support the construction industry for the next two quarters. After that, we will see how the 10th Malaysia Plan (is working) as the effects will be seen by year end and next year," MBAM president Datuk Ng Kee Leen said. The construction sector saw a growth of 8.5 per cent in the first quarter of this year. Ng was speaking to reporters after the launch of MBAM Annual Safety Conference 2010, in Kuala Lumpur yesterday. The event was officiated by Deputy Minister of Human Resources Senator Datuk Maznah Mazlan. On the expectations of the 10th Malaysia Plan, which is set to be launched on June 10, Ng said it should be positive with many projects planned to be rolled out especially with the government's focus on public private investment. "These partnerships will work well and the results will be encouraging," he said. Ng said MBAM also had a dialogue with the Public Private Partnership Unit (3PU) to work out incentives that would encourage local and foreign investments in the construction sector. The unit, which comes under the Prime Minister's Department, is the core agency responsible for coordinating the privatisation and public-private partnership (PPP) projects, and which can be given injection from the facilitation fund. Ng said MBAM has also suggested many measures to the government in order to improve the efficiency and sustainability of the construction industry. Among them are upgrading workers' skills, importing skilled foreign workers, as well as mechanisation of the construction industry by relooking at building new heavy machinery equipment. "Although there has been some improvements in the import of machineries and equipment, the duty is still high and it is hoped that the Ministry of International Trade and Industry will relook the duty rates," Ng said. He said it was important to relook the duty rates in order to encourage more players to use new equipment which are efficient, environment-friendly and with better productivity and more safety features.